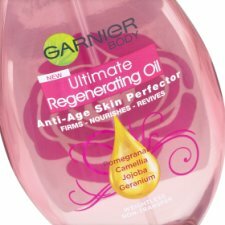 There's something rather comforting about using oils on the skin so I must admit I was rather excited to find this Garnier body oil in my local branch of Boots. I've always used baby oil on my legs whilst they're still damp from the shower so I was looking forward to amping it up a bit with this. The first thing I noticed was the gorgeous smell - warm yet floral somehow. The smell lingers on the skin all day too which is rather nice. It's easy to apply and a little goes a very long way. All I needed was one spray on the shins and two on the thighs to cover the whole leg. As a consequence it lasted an awfully long time. You know how if you get olive oil on your hands, no matter how much you rub it in, you still have to wipe your hands? That's because it's a wet oil. Dry oils don't feel 'wet' to the touch and they rub in really easily. So that was me told. My skin did feel wonderfully moisturised and supple for ages, especially if I applied it after the shower but I did find that I couldn't use it every single day because it wasn't quite enough long lasting moisture for my uber dry legs. It was a really good treat to use a couple of times a week or before a night out.